See all Other Peroneal muscle ICD-10 codes. mechanism of injury (acute dorsiflexion and violent reflex peroneal musculature contraction) precipitates an avulsion of the superior peroneal retinaculum, allowing dislocation ot the peroneal tendons anteriorly. Common in soccer and skiing. Superior peroneal retinaculum: primary retaining structure for the perneal tendons. 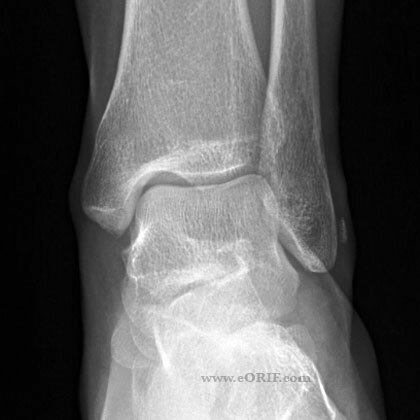 Origin: posterior margin of the distal 1-2cm of the fibula. Travels posteriorly to the lateral calcaneus with extensions into the paratenon of the Achilles tendon. 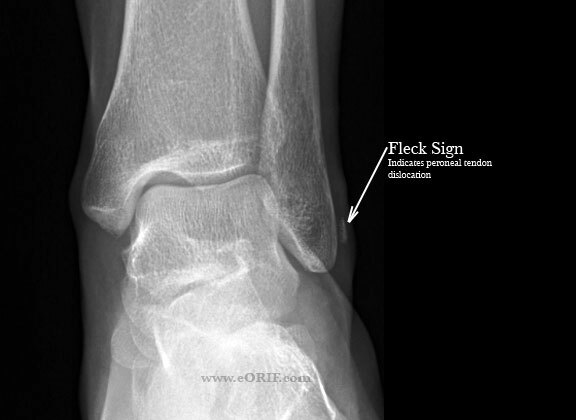 Most commonly avulses from the fibula often with a small fleck of bone. (Maffuli N, AJSM 2006;34:986). Deficient posterior distal fibular groove may contibute to peroneal instability. Approximately 25% of people have a flattened or convex peroneal groove. 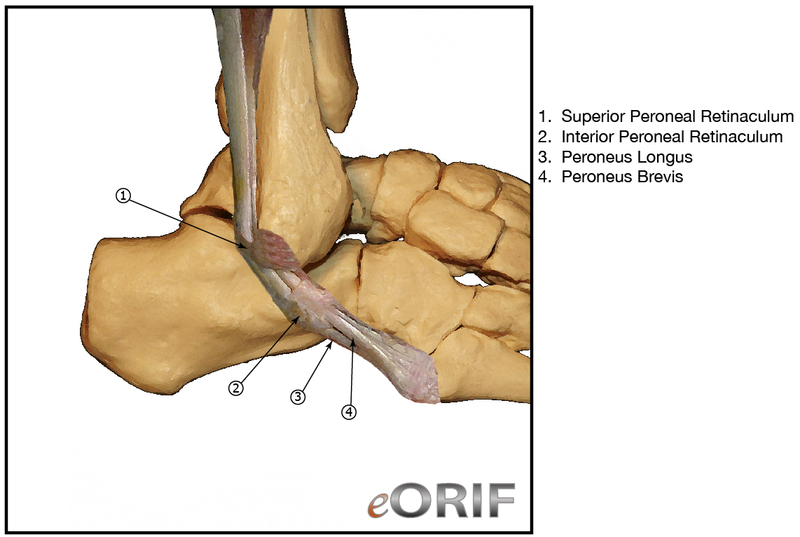 Hindfoot varus alignment is a predisposition to peroneal tendon injury. Anatomic varients in peroneal tendon sheath: low-lying peroneal brevis muscle belly; anomalous peroneal quartus tendon. Lateral ankle pain, swelling and ecchymosis. Tenderness posterioly along the peroneal tendons. Pain and weakness with active ankle dorsiflexion and external rotation. Lateral tenderness, no medial tenderness. May complain of popping in the posterolateral ankle with push off. A/P, Lateral and Mortise views of the ankle are generally normal. May demonstrate a "fleck" sign: small avulsion fracture of the lateral malleolus which is pathognomonic for acute dislocation of the peroneal tendons and indicates Grade III injury to the superior peroneal retinaculum. MRI: demonstrates peroneus brevis +/- peroneus longes dislocated anterolateral to the lateral malleolus with disruption of the peroneal retinaculum. Dynamic ultrasound: may be indicated to evaluated for pseudosubluxation of the peroneal tendons. Poor outcome with non-op treatment. Consider bracing or taping for in season athletes with definitive surgical treatment after season ends. Murr S: Dislocation of the peroneal tendon with marginal fracture of the lateral malleolus. J Bone Joint Surg 1965;43B:563-565. Eckert WR, Davis EA Jr: Acute rupture of the peroneal retinaculum. J Bone Joint Surg 1976;58A:670-672.